Bohras are a community of Muslim traders. Originating from Yemen, they had settled in Gujarat, Maharashtra, countries of East Africa as well as Pakistan. Their cuisine had been making waves in recent times and I had heard a lot about the huge thal served at their weddings. So, when The Westin Mindspace Hyderabad announced a Bohri promotion, there was much anticipation from my side. 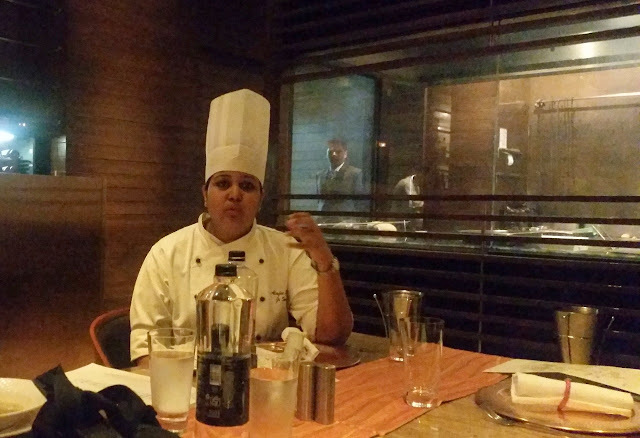 Chef Alifiya Galabhai from The Westin Mumbai Garden City is in Hyderabad to curate the festival. Extremely enthusiastic about the cuisine, she explained that a Bohri dinner usually starts with a sweet dish or meethas followed by starters known as kharaas. After a few rounds of starters and sweets, they move on to the mains. The cuisine makes extensive use of offals like brain and trotters and relies more on flavours than spices. She explained that though the huge plate called thal is where food is shared from by up to eight people in a traditional Bohri dinner. However, they were not using that format in this festival. Instead, a range of soups, starters, mains, and desserts were offered as a-la-carte dishes. She also stated that the custom is to take a pinch of salt at the start of the meal, as it cleans the palate and has therapeutic properties too. So, we did not follow the traditional way of eating Bohri food, by having it from the thal. Nor did we follow the order such as starting with a sweet dish. The first off the blocks was the Paya Soup. Very different from the paya preparations of Hyderabad and Kolkata and with indulgent flavours of meat with a garlic aftertaste, the white soup had small chunks of mutton and onion bits. The trotters were removed from the shorba before serving but the gelatin had melted into it enhancing the taste. Next were the Kharaas or appetizers. I had heard that Bohri cuisine is rich in its varieties of snacks, and indeed the festival menu had ample proofs of that. 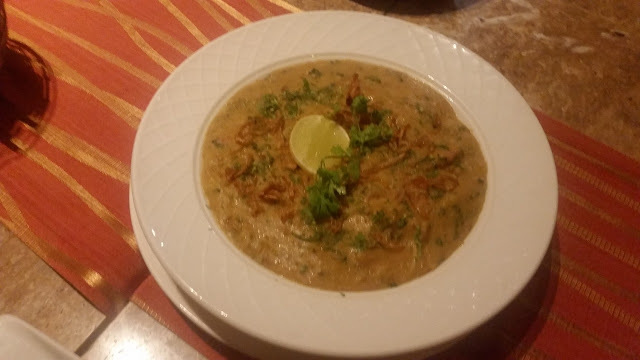 Lagan Ni Seekh is one of the signature Bohri dish. I was surprised by the looks of it, as I was expecting a skewered meat dish. 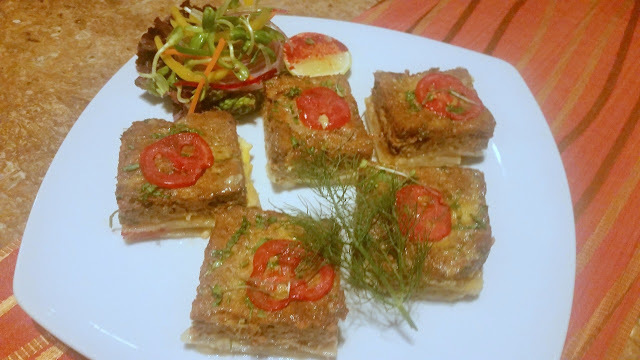 It is actually layered keema topped with egg and tomatoes, prepared on a tawa and cut into square pieces. The other popular Bohri Dish served as part of starters was Smoked Keema Samosa. 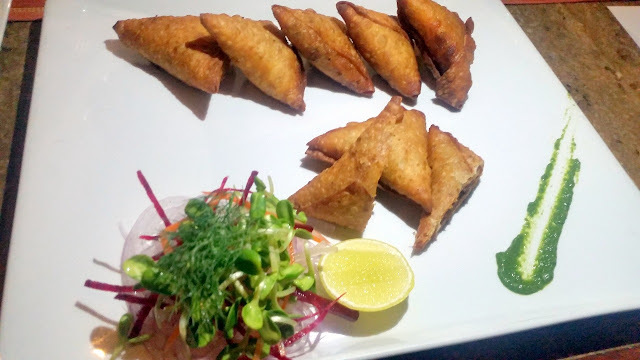 The minced meat filling is cooked in masala and smoked in a covered dish with coal embers before being stuffed in the small samosas. This was one of the best dishes of the day. 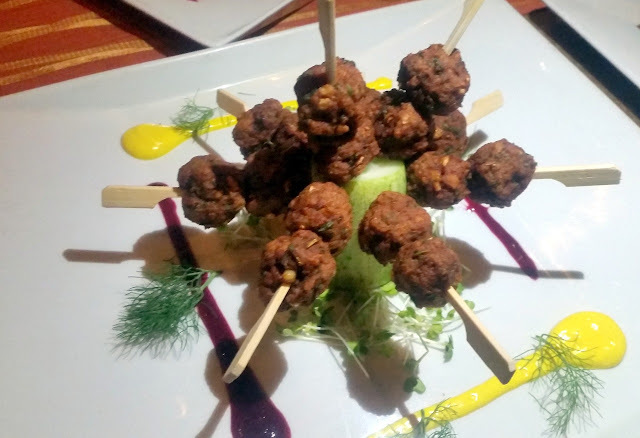 A meatball dish was named Kali Kababs. 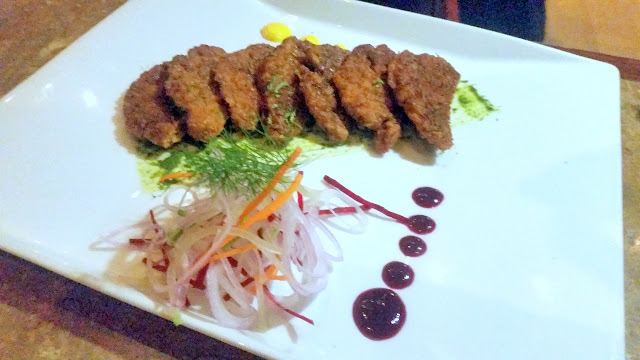 The crumb fried Keema Cutlet was quite similar to the ones we get in the bakeries of Hyderabad, with a thin layer of egg fluff used on the crust. 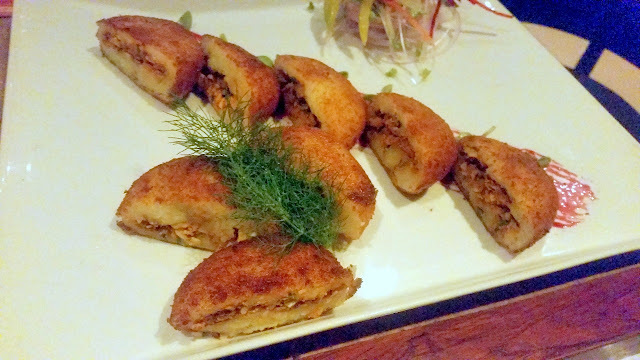 Aloo Keema Patties reminded me of the Bengali mutton “chop” which we used to enjoy in our neighbourhood. Minced mutton in basic spices covered by mashed potatoes and fried. The Russian Patties was a surprise. Diced vegetables in white sauce were made into a patty, and tasted surprisingly good. 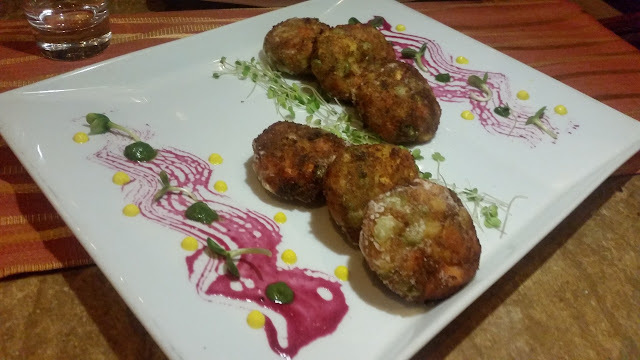 Nariyal Batata Patties was another simple vegetarian starter that was served. A mention has to be made regarding the range of pickles served on the table. I especially loved a sweet one which had mixed fruits and raisins in it. A green chutney was high on mint and went especially well with the patties. There was one more which was very garlicky. 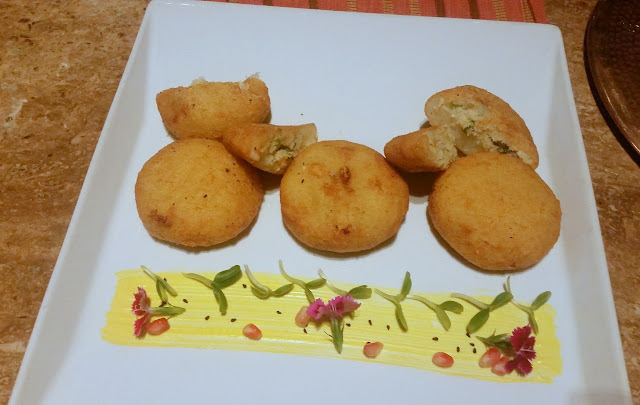 Overall, fairly strong flavours with some resemblance to their Gujarati counterparts. It was time to graduate to Jamaan or the main courses. Chef Alifiya had quite a spread laid out for us. 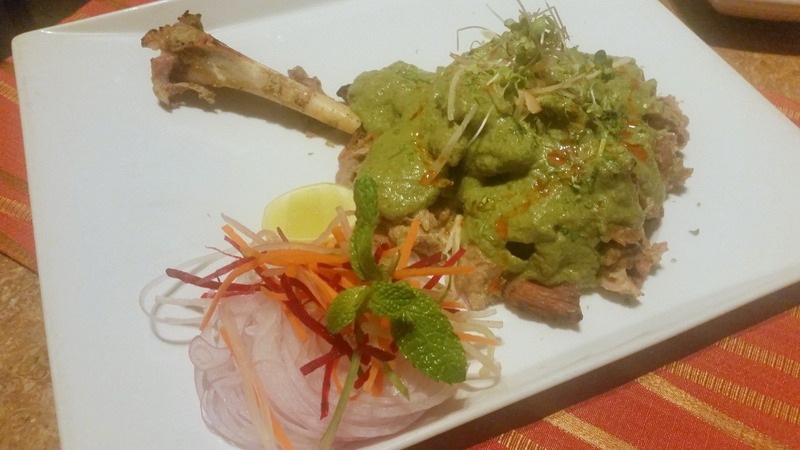 Bohra Green Mutton Raan was the pick of the dishes for me, lamb leg cooked in a minty green sauce with a distinct cashew nut flavour. I worked on it with the Khamiri Naan. 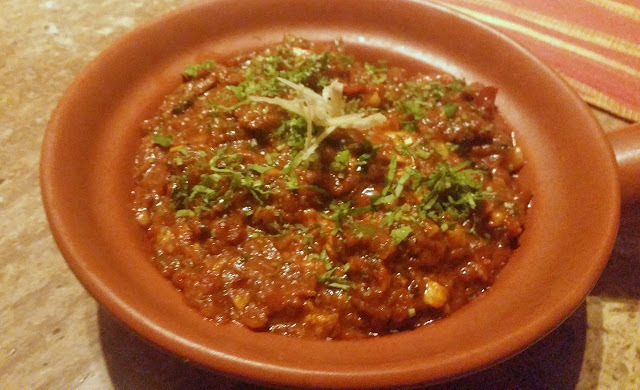 Dabba Gosht is a well-known Bohri dish. Dabba refers to a round aluminium utensil in which the meat is cooked. The mutton here was soft in a creamy cashew nut gravy. Bheja Masala was specially requested by us and the dish did not disappoint at all. The tomato and onion based gravy with chunks of lamb brain were closest to the mainland Muslim cooking. 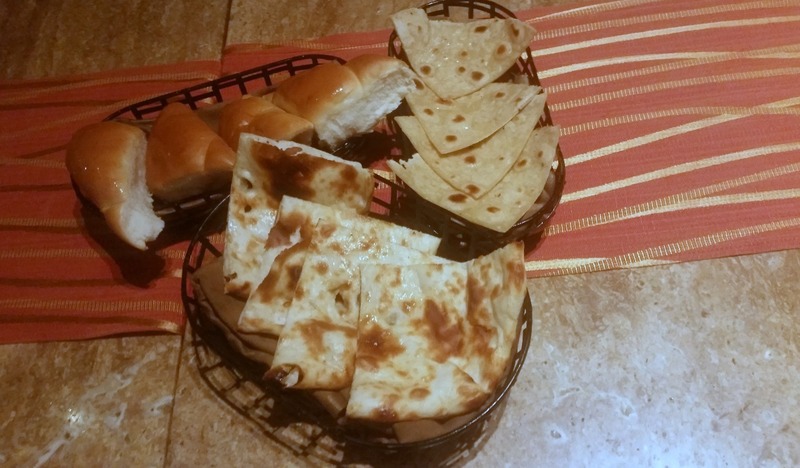 The Lamba Pao or oven-cooked fluffy bread was used to soak in the spicy gravy resulting in a delightful taste. 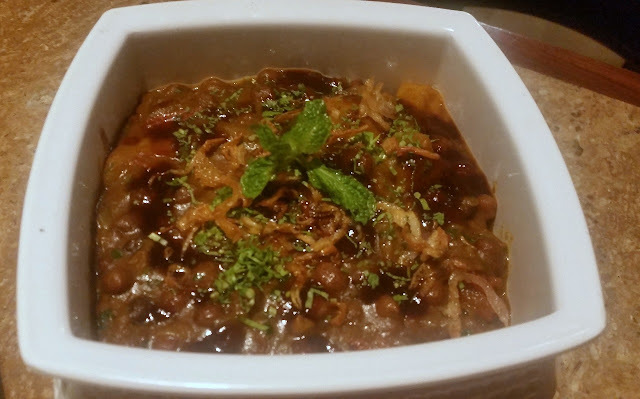 Among the vegetarian dishes, Gavarfali Ni Sabji was a tomato based gravy of cluster beans. Not high on spices it was basically home food. Kala Chana Batata again reminded me of a potato and chana dish we Bengalis prepare in diced onions. The Masoor Pulav was a simplistic rice dish prepared with masoor dal as the name suggests. A lentil and cucumber based cold soup called Sarkhi were served with it. Very earthy flavours endeared it to all. The Khichda is a complete dish with wheat and pounded mutton, and is a less rich version of our haleem sans the lentils. We Hyderabadis pride ourselves for our Kachhi Biryani and the Bohri version is markedly different. Low on spices, the biryani uses dry fruits like apricot in the masala, and a lot of curd in the marination too. 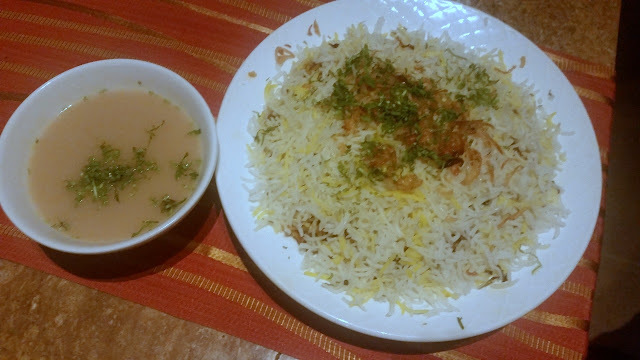 Potatoes are added to the biryani, just like it is done in Kolkata. Again a dish which relies on flavours and not on masala like its Hyderabadi counterpart. Of the desserts, I loved Dhoodhi Falooda, where bottle gourd has been cooked in milk. Kheer Puri had small sized fluffy rawa puris served with a firni like concoction. 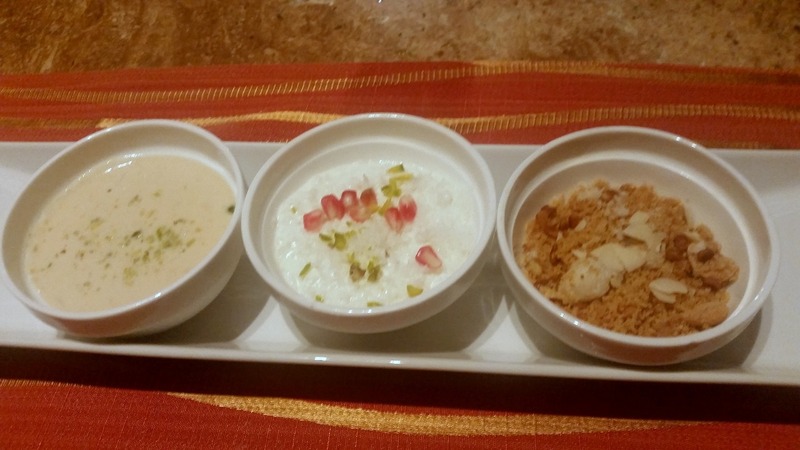 Karamro, a sweetened curd rice with fruits and nuts in it, we were told that it is a popular dessert in the cuisine. I did not like the Malida, a dry dessert prepared with wheat flour and jaggery. This is perhaps the only thing I did not like in the spread, which speaks volumes about the quality of food. In summary, a Muslim cuisine with a good number of vegetarian dishes too. 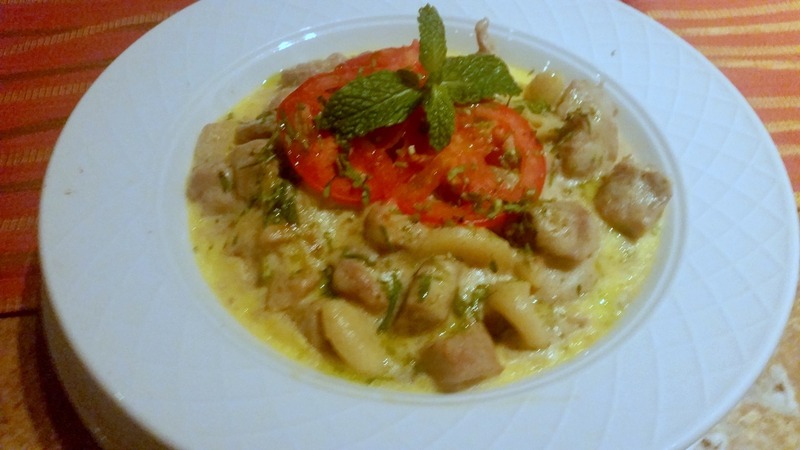 It is low on spices concentrating on the basic flavours like the food of some of the Arab countries. Apart from meat and chicken, potatoes, coconut, mint, cashew nut and garlic are some of the often used ingredients. There is a tinge of sweetness in many of the dishes. The recipes do not involve very complex preparations, and most of the dishes that I tasted made me feel a touch of home recipes. A big thank you to Chef Alifiya who patiently explained each dish, and answered my long list of often mundane queries, especially comparing this with other Muslim cuisines of India. I had a good time with the food here, though the craving to experience the Thal remained. Also, a desire to visit Bhendi Bazar from some Bohri street food. 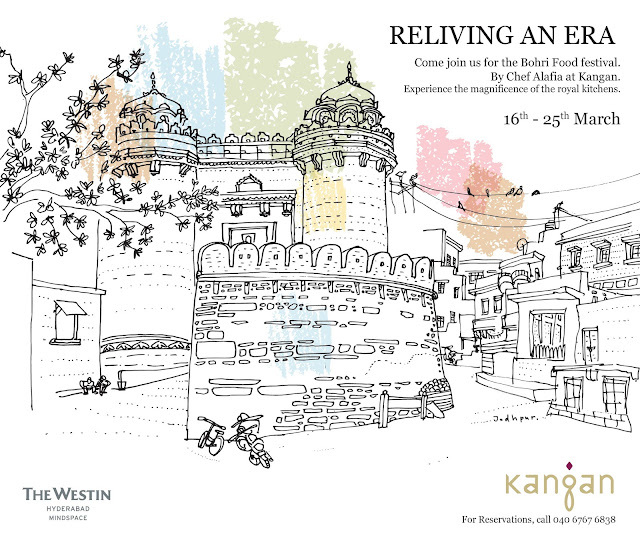 The a-la-carte festival is on at Kangan until 25th March. On Sunday afternoon, a special Bohri brunch is set up at Seasonal Tastes, the all-day dining restaurant. It will be a good experience for the discerning food lovers of the city, who can explore new cuisines with an open mind.